So many people ask me “Brittany, how do you get your crochet to look so neat?” Well my friends, I’m about to share my secret. Blocking. Many of you have probably heard of the term blocking and for you, this post will be a nice refresher. For the rest of you who have never heard of blocking, you’re about to learn an incredible skill that will take your finished objects to the next level! First things first, have a look at my blocking tutorial. Here, we will cover the three methods of blocking: wet, steam and finger blocking. Blocking is a technique used mainly on flat projects to relax your stitches and lock them into the perfect position. Make your points sharper and your edges straighter with blocking! Pin your project to a blocking board (standard sewing pins do just fine) in the position you would like for it to stay. Saturate your project with a spray bottle and some tap water. Allow it to fully dry overnight before unpinning. Blocking is NOT reversed with washing!! That’s correct, I have experienced this first hand. I spent weeks blocking over 200 little granny squares for my scrapghan a couple of summers ago. Once finished, it desperately needed washing to soften up the harsh acrylics I used to bust my yarn stash. At the time, It was an experiment. I had no clue if the squares would revert back to their round-ish shape. So I tossed it in the wash and hung it to dry. To my surprise, the squares stayed in their blocked position! Now two years and a few more washes later, they are STILL square! Using your iron on the steam setting, hover it at least 1 inch from your project and press the steam button several times, covering the entire project. Allow it to fully cool and dry before unpinning (usually about 15 minutes). I think you’ll be surprised at how well steam blocking works. I know I was! The concept is the same, the stitches are being relaxed and fixed into the position you choose but heat is added to speed up the process. 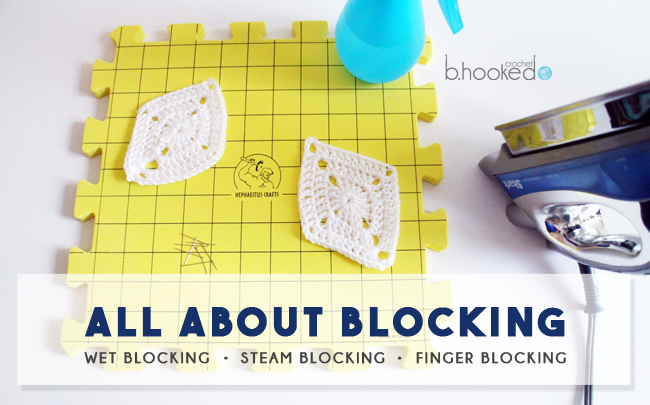 I urge you to be very careful when steam blocking your projects! 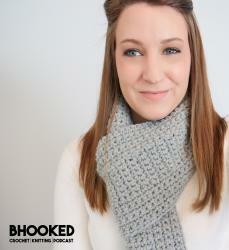 Do NOT place your iron directly on your crochet, no matter what fiber content you’ve used. Acrylics will melt to your iron and animal fibers may begin to felt. Either way, this isn’t a good situation and your project may be ruined. With that said, as long as you are careful, this is a completely safe method of blocking. Finger blocking is a method I use most often for 3D objects such as flowers. Of the three methods, I use it the most however, the results aren’t very permanent. The good part…you only need your fingers and a few seconds to finger block. 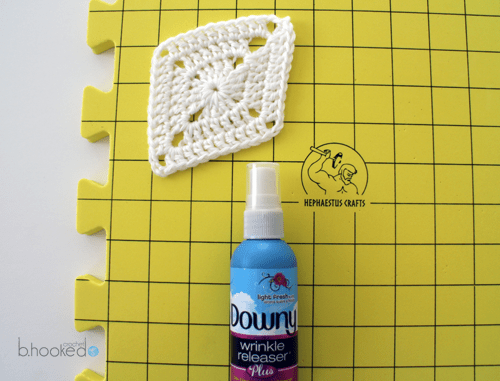 Since filming the tutorial and writing this post, I have discovered a fourth method of blocking your project and this one would be great for flat pieces AND 3D! I have to give my husband credit for this one. The block you see in the picture was first sprayed with downy wrinkle releaser and finger blocked into position. Once dried, it stayed! You will notice a slight stiffness to the crochet once dried, but it’s nothing to be concerned about. So far I have only used this on acrylic fibers but will be exploring with animal fibers too. I’ll keep you posted! I enjoyed your video. I also bought the blocking boards after watching video! How do you get money on recommending the items if someone else purchase the item you recommend. That’s wonderful! Thank you so much for the support 🙂 If you direct them to the post where they can click on the products, that’ll make sure the commission will be directed to me. Thank you so much for offering! What are your thoughts on using a mixture of fabric softener and water for blocking? I’ve never blocked any of my blanket/afghans. Is that why, when i fold them up to put away, the corners don’t match up evenly? Also, after blocking, when you wash your afghan/blanket, will it still keep it’s shape? That’s exactly right! Your corners won’t naturally line up unless you block everything to the same size. In my experience, blocked afghans held their shape after washing but I did not put them in the dryer. This particular afghan has gone through two washes and the squares are still perfect.